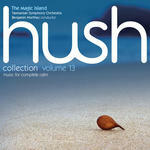 The Magic island : Hush collection, volume 13 / Tasmanian Symphony Orchestra ; Benjamin Northey, conductor. Recorded/performed at: Federation Concert Hall, Hobart Brenton Broadstock Tasmanian Symphony Orchestra, Benjamin Northey 4 mins, 31 sec. Recorded/performed at: Federation Concert Hall, Hobart Ross Edwards Tasmanian Symphony Orchestra, Benjamin Northey 5 mins, 14 sec. Recorded/performed at: Federation Concert Hall, Hobart Paul Grabowsky Tasmanian Symphony Orchestra, Benjamin Northey 6 mins, 32 sec. Recorded/performed at: Federation Concert Hall, Hobart Iain Grandage Tasmanian Symphony Orchestra, Benjamin Northey 5 mins, 52 sec. Recorded/performed at: Federation Concert Hall, Hobart Stuart Greenbaum Tasmanian Symphony Orchestra, Benjamin Northey 6 mins, 35 sec. Recorded/performed at: Federation Concert Hall, Hobart, on Sep 12. Maria Grenfell Tasmanian Symphony Orchestra, Benjamin Northey 4 mins, 6 sec. Recorded/performed at: Federation Concert Hall, Hobart Matthew Hindson Tasmanian Symphony Orchestra, Benjamin Northey 5 mins, 55 sec. Recorded/performed at: Federation Concert Hall, Hobart Elena Kats-Chernin Benjamin Northey, Tasmanian Symphony Orchestra 4 mins, 28 sec. Recorded/performed at: Federation Concert Hall, Hobart Graeme Koehne Tasmanian Symphony Orchestra, Benjamin Northey 4 mins, 5 sec. Recorded/performed at: Federation Concert Hall, Hobart Graeme Koehne Tasmanian Symphony Orchestra, Benjamin Northey 5 mins, 11 sec. Recorded/performed at: Federation Concert Hall, Hobart Peter Sculthorpe Tasmanian Symphony Orchestra, Benjamin Northey 3 mins, 17 sec. Recorded/performed at: Federation Concert Hall, Hobart Paul Stanhope Tasmanian Symphony Orchestra, Benjamin Northey 4 mins, 12 sec. Recorded/performed at: Federation Concert Hall, Hobart Nigel Westlake Tasmanian Symphony Orchestra, Caroline Almonte, Benjamin Northey 4 mins, 14 sec. The AMC library reference CD contains programme notes in the CD liner.